I'm delighted to announce the first ever Skin Deep Giveaway! Fade Out is celebrating Valentine's Day by offering one lucky winner a skin care goodie pack comprised of Original Moisturising Cream and a Brightening Anti-Shadow Eye Cream, valued at approx. £20. Whether you're prepping for that special date or planning on some singleton pampering, Fade Out will help to promote a glowing complexion and tackle issues such as dryness which are associated with wintery weather. 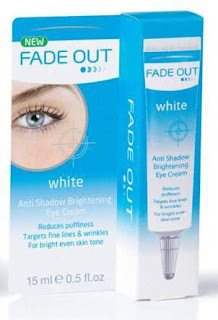 Fade Out is not a skin whitening cream- Skin Deep will NEVER promote such products- yet it works to even skin tone, target hyperpigmentation and visibly brighten. The range is suitable for both men & women and is available from Boots nationwide. Fade Out White Original Moisturising Cream- staple product for all skin types. The perfect pick me up for dull complexions, used regularly, this must have treatment will leave you with a smoother, brighter, younger looking complexion. Fade Out White Anti Shadow Brightening Eye Cream- formulated to reduce under eye circles and delay the signs of aging, this tinted eye cream contains light reflecting particles to instantly hide imperfections. Enriched with Vitamin A to hydrate and assist the production of collagen, helping the skin appear firmer. - I will use a random number generator to select the winner. This will be announced on Skin Deep on Friday 11th February and the prize will be sent directly from a Fade Out representative. Entries will be accepted until 1pm (GMT) on 11th. I'm always up for trying new products that promise to do away with under-eye circles, as it is my biggest beauty angst! I would love to be entered for this please! Hi there, I am following your blog via networked blogs. What a fab giveaway. My Valentine pamper tip would be to have a bath using your favourite scented bath oils, put on your favourite face mask and relax, then make-up, dress up and go out with your favourite person for an evening of romance. Aah if only I wasn't working on Valentine night. What a wally, forgot to add my tip! Take the day as holiday, have a lie in, do your nails, take your time to everything, long soak in the bath, hair masks, the works. ooo a pamper tip - layer your perfume by using the body lotion in the same fragrance under your perfume, it will last longer and you will need less perfume! My tip is have a good nights sleep. It will make you feel refreshed and your skin will look amazing too! My favourite way to pamper is a long bath with a bath bomb or something similar, and a face mask. I love the Fade Out Creams too. I have been using them for a long time. They are difficult to find in the USA, but there is one USA company that sells and ships them to you in no time. They are LoveThatSkin.com. Best of luck to everyone. It looks like a good giveaway for different skin concerns but have you tried it? Does it really do what it claims? I had a chemical peel treatment last month and it really helped to improve my skin tone, texture, acne and hyperpigmentation.